There are many unsung heroes in our city. Though they play a very important role in our society and contribute to all our lives, their services are usually taken for granted and they go unrecognized. Actually they are vital part of our urban lives. The auto-rickshaw drivers, police constables, railway porters, and pourakarmikas - all play important roles to make the city's life tick and we benefit from their hardwork. 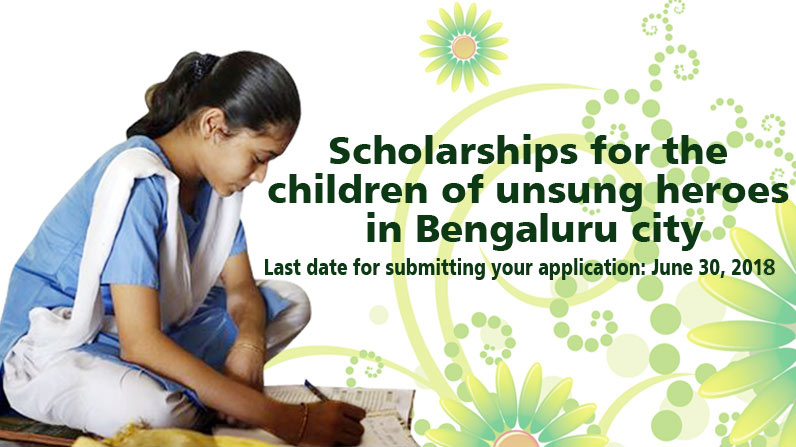 In a humble attempt to recognize these unsung heroes, ISKCON Bangalore is announcing scholarships sponsored by The Learning Society for their children. 1. The eligibility will be solely on merit and the family's financial needs. 2. Students from Bengaluru who have appeared for SSLC Board exam or II PUC or equivalent exam in 2018, and scored 95% or more in the previous examination. 3. This scholarship is for the children of unsung heroes in our city. Children of auto-rickshaw drivers, police constables, railway porters and paura karmikas are eligible to apply. Those who are working for daily wages, or handicapped, or unemployed can also take advantage of this scholarship scheme. 4. The last date for submitting your application is June 30, 2018 (Saturday). Do not forget to share this information with your friends and colleagues.